MYB-CC transcription factors (TFs) genes have been demonstrated to be involved in the response to inorganic phosphate (Pi) starvation and regulate some Pi-starvation-inducible genes. However, their role in drought stress has not been investigated in bread wheat. In this study, the TaMYBsm3 genes, including TaMYBsm3-A, TaMYBsm3-B, and TaMYBsm3-D, encoding MYB-CC TF proteins in bread wheat, were isolated to investigate the possible molecular mechanisms related to drought-tolerance in plants. TaMYBsm3-A, TaMYBsm3-B, and TaMYBsm3-D were mapped on chromosomes 6A, 6B, and 6D in wheat, respectively. TaMYBsm3 genes belonged to MYB-CC TFs, containing a conserved MYB DNA-binding domain and a conserved coiled–coil domain. TaMYBsm3-D was localized in the nucleus, and the N-terminal region was a transcriptional activation domain. TaMYBsm3 genes were ubiquitously expressed in different tissues of wheat, and especially highly expressed in the stamen and pistil. Under drought stress, transgenic plants exhibited milder wilting symptoms, higher germination rates, higher proline content, and lower MDA content comparing with the wild type plants. P5CS1, DREB2A, and RD29A had significantly higher expression in transgenic plants than in wild type plants. TaMYBsm3-A, TaMYBsm3-B, and TaMYBsm3-D were associated with enhanced drought tolerance in bread wheat. Overexpression of TaMYBsm3-D increases the drought tolerance of transgenic Arabidopsis through up-regulating P5CS1, DREB2A, and RD29A. Drought is a severe environmental stress influencing the productivity of corps worldwide. Drought tolerance is a complex phenotype in plants, and is associated with diverse metabolic and morphological pathways . Transcriptional regulation contributes to the response of drought stress in plants . It is noteworthy that the transcription factors (TFs) function in the regulation of diverse physiological and biochemical responses to drought stress by activating diverse stress-related genes . Until now, various TFs have been identified to be associated with the drought stress response, including MYB, bZIP, AP2/ERF, NAC, and WRKY [4, 5]. The MYB TFs comprise a larg gene family in plants . MYB, firstly discovered in maize, is characterized by containing a MYB DNA-binding domain in its N-terminus that consists of one or more imperfect tandem repeat(s) [7, 8]. The MYB TFs participate in many development processes in plants, such as regulation of cell cycle and cell development, controlling of primary and secondary metabolism, and responses to abiotic and biotic stresses [9, 10]. To date, massive MYB proteins have been detected in diverse plants, such as rice, wheat, Arabidopsis, grapes, and petunias . It has been reported that PbrMYB21, an MYB TF of Pyrus betulaefolia, can promote drought tolerance by modulating polyamine levels via arginine decarboxylase genes . The up-regulated OsMYB48–1, an MYB TF of Oryza sativa, promotes drought tolerance of rice by influencing the synthesis of ABA . Overexpression of TaODORANT1, an R2R3-type MYB TF of Triticum aestivum, promotes drought tolerance of tobacco by activating genes associated with stress and reactive oxygen species (ROS) . The molecular mechanisms underlying MYB proteins functioning on drought tolerance of plants have been intensively studied. A previous study showed that overexpressed abscisic acid (ABA)- and drought-inducible AtMYB96 could activate the wax biosynthesis genes and increase the deposition of cuticular waxes, thereby leading to enhenced drought tolerance in Arabidopsis . Moreover, a recent study reported that the TaMYB31s were upregulated under ABA treatment, and overexpressed TaMYB31-B could increase ABA sensitivity during seed germination . Specially, ABA regulates adaptive responses to environmental stresses, and promotes the tolerance to various abiotic stresses including drought . The balance between ABA biosynthesis and catabolism determines its role under drought-stress condition . Thus, the increased drought tolerance are partly attributed to ABA . MYB-CC TFs are the members of the MYB TF superfamily, being characterized by containing a conserved MYB DNA-binding domain and a coiled–coil (CC) domain, which is a potential dimerization motif. . Currently, MYB-CC TFs are demonstrated to be related to the response to inorganic phosphate (Pi) starvation and regulate a series of Pi-starvation-inducible genes [20, 21, 22]. Nevertheless, its role in drought tolerance has not been reported to our knowledge. Bread wheat (Triticum aestivum L.) is a main food crop in the world. The repercussions of climate change, particularly drought stress, severely affect wheat yield globally. Identification of drought-responsive genes, especially TF genes, may be of benefit by revealing the molecular mechanisms involved in drought responses in plants. Presently, many wheat MYB genes containing full-length gene sequences have been isolated , including some drought stress response-associated gene, such as TaMYB31 . Given the drought tolerance of MYB genes in wheat and other plants, we hypothesized that MYB-CC TF genes may also play a role in drought stress in bread wheat. Herein, three TaMYBsm3 homologue genes (TaMYBsm3-A, TaMYBsm3-B, and TaMYBsm3-D) isolated from wheat were cloned and characterized by screening bacterial artificial chromosomal (BAC) library. The ability of TaMYBsm3 genes in regulating the drought response was investigated in TaMYBsm3-D transgenic Arabidopsis, due to the high conservation of TaMYBsm3-D in wheat. We for the first time revealed that TaMYBsm3, a MYB-CC TF, was involved in plant drought stress response. Our results may shed light on the molecular mechanism of drought response and improve the cultivation of plant varieties with drought tolerance. Nested PCR primers (NP), as shown in Table 1, were designed to screen BAC libraries  of Triticum aestivum (T. aestivum) cultivar Shimai 15 that contained TaMYBsm3 genes according to the expressed sequence tags (EST) (GenBank No. BJ243280). BAC pool plasmids served as template and the PCR programs included 35 cycles of 94 °C for 45 s, 55 °C for 45 s, 72 °C for 45 s, and an extension at 72 °C for 5 min. Then three BACs containing TaMYBsm3 genes were used to construct 10-kb subclone libraries using the BamHI site of the pCC1BAC vector. Three full-length genomic DNA sequences of TaMYBm3 genes were isolated by screening subclone libraries and sequencing subclones. Full-length cDNAs were amplified from a cDNA template of 2-week-old Shimai15 seedlings. The primers (TaMYBsm3-AFL, TaMYBsm3-BFL, and TaMYBsm3-DFL) (Table 1) were used to isolate the full-length cDNAs and genomic DNAs of the TaMYBsm3 genes were designed on the basis of the TaMYBsm3 genomic DNA sequences. The PCR and RT-PCR were amplified using 2 × Pfu PCR MasterMix (TIANGEN BIOTECH, Beijing, China). The PCR program was 95 °C for 5 min, 30 cycles of 94 °C 30 s, 55 °C for 30 s, 72 °C for 3–5 min and then at 72 °C for 8 min. A set of nullisomic-tetrasomic lines of T. aestivum ‘Chinese Spring’ (CS NT) were used for determining the chromosomal location of the TaMYBsm3 homologue genes. Primers used in the chromosomal location of TaMYBsm3 genes (DW) (Table 1) were designed in accordance with the differences in DNA sequence. DNA isolated form a nullisomic tetrasomic line of Chinese Spring (NT-CS) was used as the template. The PCR program included 30 cycles of 94 °C for 30 s, 60 °C for 30 s, 72 °C for 60 s, and an extension at 72 °C for 8 min. Sequence assembly as well as coding region prediction were conducted with Lasergene SeqMan II Module (DNAStar). Phylogenetic analysis was carried out using neighbor-joining and maximum parsimony methods with 1000 bootstrap replicates using MEGA4.1, and a phylogenetic tree was constructed based on 20 MYBsm3-like proteins (including TaMYBsm3 proteins). In order to make stronger phylogenetic inferences and to test whether they were congruent, we reconstructed trees by Bayesian analysis using MrBayes v. 3.2.2 [× 64]. Multiple sequence alignment was performed using the software of ClustalW1.83. A transactivation assay was performed as previously described . The full-length cDNA (TaMYBsm3F), N-terminal region (TaMYBsm3N, 1-148aa), C-terminal region (TaMYBsm3C, 149-386aa), and myb-SHAQKYF region (TaMYBsm3M, 184-308aa) of TaMYBsm3-D were amplified using specific primers (TR1-TR4) (Table 1). 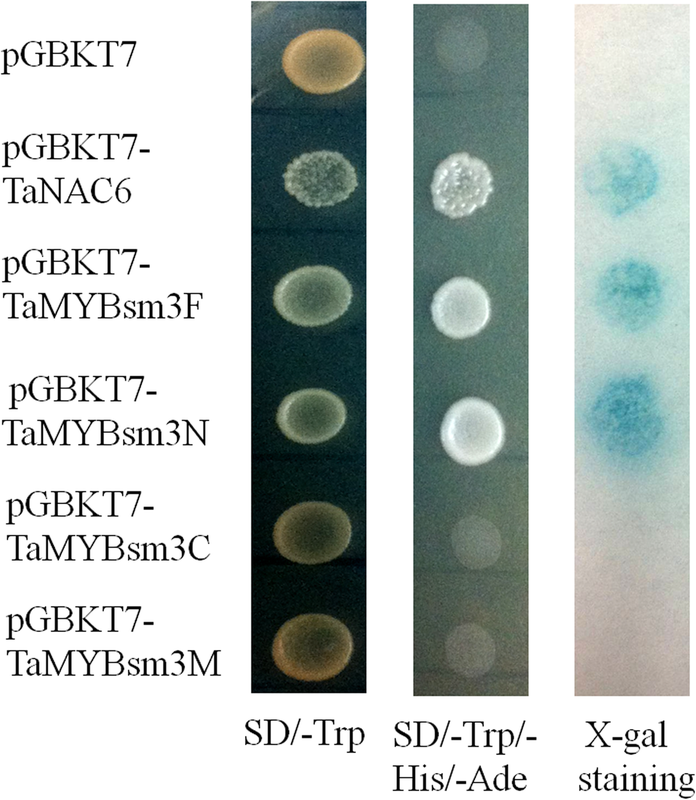 After being cloned in the pMD18-T plasmid (TaKaRa, Dalian, China), the PCR products were integrated into the GAL4 DNA-binding domain of the pGBKT7 plasmid (Clontech, Shanghai, China) between the BamHI and PstI sites. Then, the recombinants were transformed into yeast strain Y190 (MATa, HIS3, lacZ, rp1, leu2, cyhr2). Next, they were cultured in selection medium (SD/−Trp/−His/−Ade) containing 25 mM 3-amino-1, 2, aminotriazole for 1 day, the β-galactosidase activity was detected by X-gal staining . The amplification of full-length cDNA sequence of TaMYBsm3-D was performed by PCR using specific primers (TSR) (Table 1) and inserted into the binary vector pCAMBIA1300-sGFP between the sites of XbaI and BamHI. Positive clones were identified by sequencing. The construct was transformed into epidermal cells of Nicotiana benthamiana (N. benthamiana) in accordance with particle bombardment technology. The fluorescence of GFP was observed under a microscope (Leica SP8, Germany). Total RNA was extracted from different tissues (root, stem, leaf, stamen, pistil, and seed) of wild type (WT) plants (Shimai 15) using TRIZOL reagent. Synthesis of first-strand cDNA was conducted using a cDNA Synthesis Kit (TaKaRa). RT-qPCR was performed to detect the expression pattern of TaMYBsm3-A, TaMYBsm3-B, and TaMYBsm3-D using specific primers (WT, WQA, WQB, and WQD) (Table 1). The PCR program included 40 cycles of 95 °C for 30 s, 60 °C for 30 s, and 72 °C for 30 s. The β-actin gene served as an internal control. The amount of mRNA relative to β-actin was calculated using the 2-△△Ct method. In addition, WT plants were treated with 16% polyethylene glycol (PEG) 8000, and the expression of TaMYBsm3-A, TaMYBsm3-B, and TaMYBsm3-D was detected in leaves and roots at different time points. The open reading frame (ORF) of TaMYBsm3-D was amplified with specific primers (TaMYBsm3R) (Table 1) and inserted into the vector pCAMBIA2300 containing the CaMV35S promoter between the BamHI and PstI sites. The resultant vector was named CaMV35s:TaMYBsm3-D. Then, CaMV35s:TaMYBsm3-D was transformed into Arabidopsis thaliana cultivar Columbia-0 using the A. tumefaciens strain GV3101 in accordance with the floral dipping method . Three homozygous transgenic lines (L4, L8, and L13) were confirmed by RT-qPCR and isolated for further assays. In addition, WT plants were treated with 16% PEG8000, and the expression of TaMYBsm3-A, TaMYBsm3-B, and TaMYBsm3-D was detected in leaves and roots at different time points. The transgenic plants together with WT plants (N = 30) were grown for 4 weeks under normal conditions. Then, watering was stopped for 2 weeks. To investigate drought adaptability, plants were re-watered for 2 days, and the phenotypic changes were photographed at different time points. There were three experimental replicates. The seeds of the WT and transgenic plants (N = 100) were planted in 1/2 MS medium that contained 16% PEG8000. Seeds with radical tip expanding the seed coat were considered as germination. The number of germinated seeds was recorded, and the germination rate was calculated. There were three experimental replicates. The WT plants and transgenic plants (N = 30) were grown for 4 weeks under normal conditions. The fresh weight of aerial parts was recorded every hour until no obvious difference was detected between two adjacent time points. After 24 h of drying at 85 °C, the dry weight was measured. The water-loss rate was calculated as: (fresh weight at different time points - dry weight) / (initial fresh weight - dry weight). There were three experimental replicates. The transgenic plants together with WT plants (N = 30) were grown for 4 weeks under normal conditions. After 2 days of drought treatment, rosette leaves were collected. The proline content (nmol g− 1 FW) was measured in accordance with the ninhydrin acid reagent method. MDA content was measured as previously described . There were three experimental replicates. Two-week-old seedlings of transgenic plants together with WT plants (N = 5) were treated with 16% PEG 8000 for 24 h. The expression levels of three downstream drought-stress-related genes, DREB2A, P5CS1, and RD29A were detected using RT-qPCR with specific primers, as described above (Table 1). 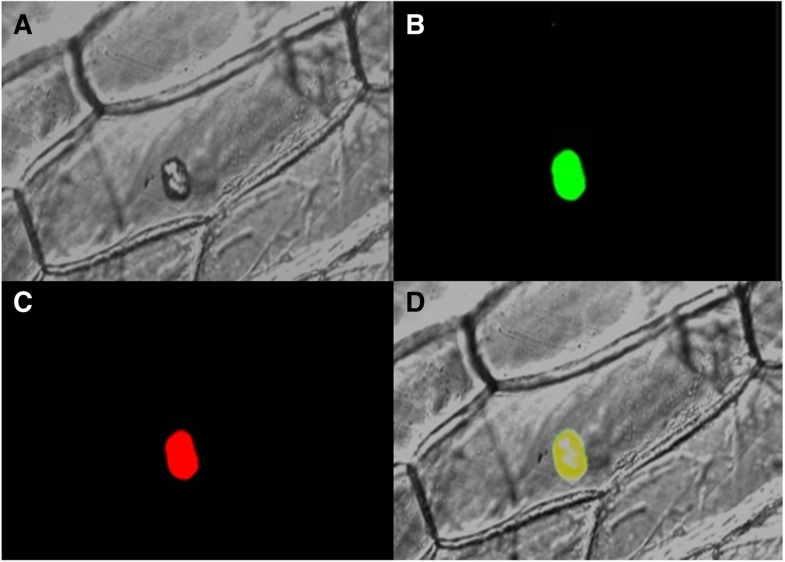 The Arabidopsis β-actin was used as internal control. cDNA product was used as template for 40 cycles of 95 °C 2 min, 95 °C 30 s, 59 °C 30 s, 72 °C 30 s. The 2-△△Ct method was used for quantitative analysis. Statistical analysis was conducted using SPSS version 17.0 (SPSS Inc., Chicago, IL). All data were expressed as mean ± standard deviation (SD). Comparison between different groups was tested by one-way ANOVA, followed by student’s t-test. A p-value less than 0.05 was considered significantly different. Three full-length genomic DNA sequences containing TaMYBsm3 homologue genes (NP6A, NP6B, and NP6D) were cloned in BAC libraries of the T. aestivum cultivar Shimai 15. These three genes were mapped on chromosomes 6A, 6B, and 6D in NT-CS, and named as TaMYBsm3-A, TaMYBsm3-B, and TaMYBsm3-D, respectively (Fig. 1a). When blasting with the genomic sequence of NT-CS (https://plants.ensembl.org/Triticum_aestivum/Info/Index), TaMYBsm3-A, TaMYBsm3-B, and TaMYBsm3-D were highly consistent with the sequences on chromosomes 6AS, 6BS, and 6DS, respectively. Sequence analysis showed that TaMYBsm3-A and TaMYBsm3-D had the same gene structures with 7 exons and 6 introns, and TaMYBsm3-B had 8 exons and 7 introns. The ORFs of TaMYBsm2-A, TaMYBsm3-B, and TaMYBsm3-D were 1248 bp, 1152 bp, and 1161 bp in length, encoding 415, 383, and 386 amino acids, respectively (Fig. 1b). TaMYBsm3-A, TaMYBsm3-B, and TaMYBsm3-D shared 90.4–92.9% homology at the nucleotide level and 86.1–93.0% homology at the amino acid level. A total of 20 MYBsm3-like proteins isolated from different plants were used for phylogenetic analysis. As shown in Fig. 2a, MYBsm3-like proteins were divided into two divergent branches, including monocot and dicot. TaMYBsm3-A, TaMYBsm3-B, and TaMYBsm3-D were evolutionarily close to AeMYBsm3 in Aegilops tauschii (Fig. 2a). 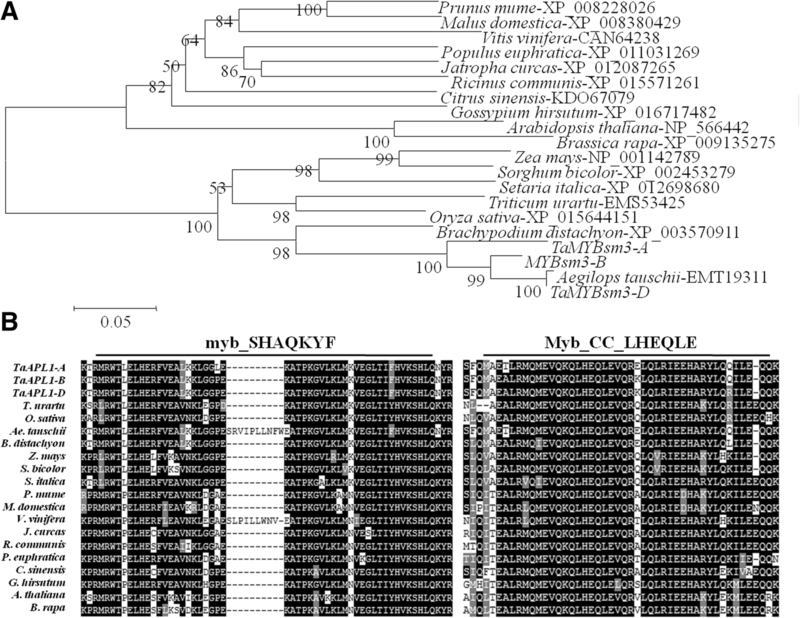 Multiple alignments showed that MYBsm3-like proteins contained a highly conserved MYB DNA-binding domain (myb_SHAQKYF) and a highly conserved CC domain (Myb_CC_LHEQLE) (Fig. 2b). The transcriptional activity of TaMYBsm3-D was analyzed in yeast. 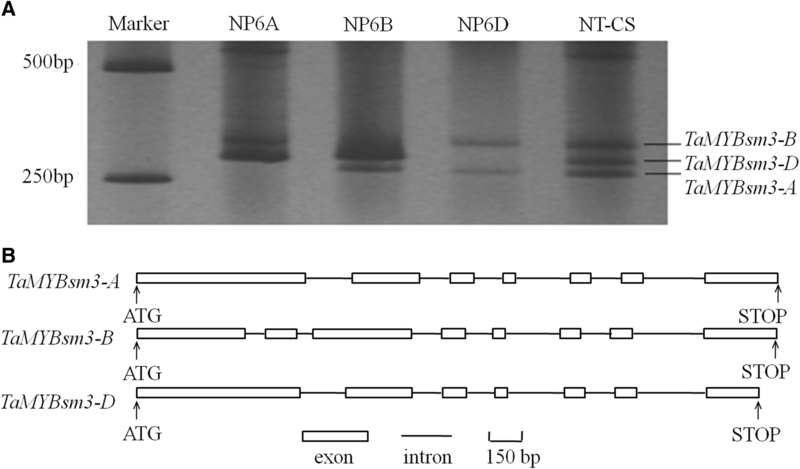 The full-length cDNA (TaMYBsm3F), N-terminal region (TaMYBsm3N), C-terminal region (TaMYB-sm3C), and myb-SHAQKYF region (TaMYBsm3M) were transformed into yeast strain Y190. As shown in Fig. 3, the activity of β-galactosidase was found in yeast cells carrying TaMYBsm3F and TaMYBsm3N, but not in yeast cells carrying TaMYBsm3C and TaMYBsm3M (Fig. 3). This result indicated that the N-terminal region of TaMYBsm3 was a transcriptional activation domain. To examine the subcellular localization of TaMYBsm3-D, the full-length cDNA sequence of TaMYBsm3-D was integrated into pCAMBIA1300-sGFP. The fluorescent signal of GFP was found in the nucleus of transformed tobacco epidermal cells. This phenomenon indicated that TaMYBsm3-D was localized in the nucleus (Fig. 4). RT-qPCR was used to study the expression pattern of three TaMYBsm3 homologue genes in wheat. TaMYBsm3-A, TaMYBsm3-B, and TaMYBsm3-D exhibited a consistent expression pattern in wheat. As shown in Fig. 5, TaMYBsm3 genes were ubiquitously expressed in the root, stem, leaf, stamen, pistil, and seed, and was especially highly expressed in the stamen and pistil. 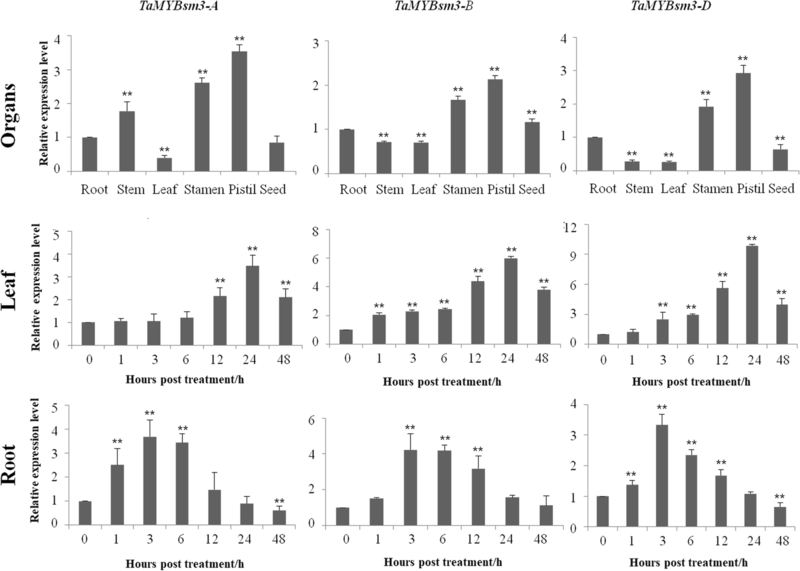 Because of the treatment with 16% PEG8000, the expression of TaMYBsm3 genes was significantly increased in the leaf with a peak at 24 h, and in the root with a peak at 3 h (Fig. 5). To reveal the drought tolerance ability of TaMYBsm3-D, TaMYBsm3-D was transformed into Arabidopsis. After 4 weeks of growth under normal conditions, both the WT plants and the transgenic lines (L4, L8, and L13) exhibited normal phenotypes and growth status. After 2 weeks of water deprivation, severe wilting symptoms were observed in the WT, whereas the wilting symptoms were mild in transgenic lines. After 2 days of re-watering, most WT plants died, whereas some transgenic plants recovered to normal growth status (Fig. 6a). The germination rates of transgenic plants were higher than that in WT plants under drought stress (P < 0.01) (Fig. 6b). The water loss rates were significantly lower in transgenic plants compared with in WT plants under normal conditions (P < 0.05) (Fig. 6c). Furthermore, significantly higher proline and lower MDA contents were revealed in transgenic plants compared with that of the WT (P < 0.05) (Fig. 6d, e). Taken together, the above results indicated that the drought tolerance of transgenic Arabidopsis was improved by overexpressed TaMYBsm3-D.
To reveal the molecular mechanisms related to the drought response of TaMYBsm3-D transgenic plants, the expression levels of DREB2A, P5CS1, and RD29A (three abiotic stress-responsive genes) were detected. As shown in Fig. 7, the expression levels of DREB2A, P5CS1, and RD29A were significantly higher in transgenic plants than in WT plants (P < 0.01) (Fig. 7). The results indicated that TaMYBsm3-D may enhance the drought tolerance through up-regulating abiotic stress-responsive genes. Drought is a major environmental stress which limits the productivity of wheat. Searching for novel genes involved in drought tolerance has become a hot topic in breeding . Recently, some MYB-CC genes have been described to be related to Pi availability, but their role in drought stress tolerance of plants has not been reported. The PHR1-like genes, TaPHR1 genes, were mapped on chromosomes 7A, 4B, 4D and involved in Pi signaling in bread wheat . In this study, three TaMYBsm3 homologue genes with potential drought resistance ability were isolated from T. aestivum Shimai 15 by screening the BAC library. The three genes were mapped on chromosomes 6A, 6B, and 6D in wheat, and named TaMYBsm3-A, TaMYBsm3-B, and TaMYBsm3-D, respectively. TaPHR1 and TaMYBsm3 share 32.1–33.7% identity at the nucleotide level and 23.1–26.7% identity at amino acid level, but their two motifs, myb_SHAQKYF and coiled-coil, are highly conserved. The results indicate that TaPHR1 and TaMYBsm3 are members of MYB-CC TF family, but they are strongly divergent at the nucleotide and amino acid levels, which may be associated with their diverse functions. TaMYBsm3 belongs to MYB-CC TF, containing a conserved SHAQKYF motifMYB DNA-binding domain at the N-terminal and a conserved CC domain at the C-terminal. 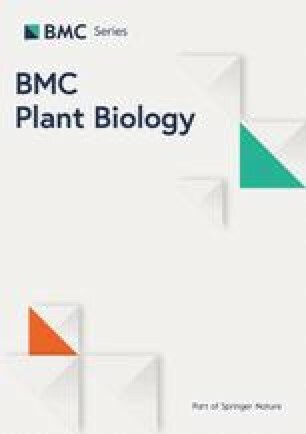 The two motifs of plant MYBsm3 homologues exhibited significant conservation and showed no significant difference between dicot and monocot plants . Our further assays showed that TaMYBsm3-D was localized in the nucleus, and presented a transactivation activity of a GAL4-containing reporter gene, indicating the predicted role of TaMYBsm3-D as a TF. The subcellular localization of TaMYBsm3-D was consistent with most known MYB genes from diverse species, such as AtMYB26 , OsMYB48–1 , TiMYB2R-1 , and TaMYB80 . The MYB DNA-binding domain at the N-terminal directly contributed to the transcriptional activation of TaMYBsm3-D. In this study, the involvement of TaMYBsm3 to drought stress was firstly analyzed by RT-qPCR in wheat. The TaMYBsm3 gene was induced by 16% PEG8000, but presented different expression profiles in leaves and roots of bread wheat. The expression of TaMYBsm3 genes was significantly increased in the leaf with a peak at 24 h, while in the root with a peak at 3 h, which indicated that TaMYBsm3 genes were sensitive to drought stress in leaves and roots, and the response of TaMYBsm3 was higher in leaves than in roots. Then, the drought resistance ability of TaMYBsm3-D was further evaluated using TaMYBsm3-D transgenic Arabidopsis plants. The result showed that the transgenic plants exhibited milder wilting symptoms than WT plants under drought stress, and could recover to normal growth status after re-watering. Furthermore, significantly lower water loss rates were observed in transgenic plants comparing with that of WT plants. These phenomena illustrated that the transgenic plants had greater drought tolerance than WT plants. Specially, transgenic plants presented significantly higher germination rates WT plants than WT plants. For most seeds, germination begins with the imbibition of water, which generally included three processes: rapid initial water uptake, a plateau phase with little change in water content, and an increased water content coincident with radicle growth . Although moisture is an important factor that determines the germination rate, there are many other factors that affact the germination rate, such as temperature, oxygen, light, and some intrinsic factors. Thus, the higher germination rate of transgenic plants may be related to other mechanisms. The drought resistance characteristics of TaMYBsm3-D are consistent with several known drought resistant MYB genes, such as AtMYB96 , PbrMYB21 , OsMYB48–1 , and TaODORANT1 . Proline and MDA are important physiological indicators of drought stress [36, 37]. Drought stress can damage the membrane of plant cells and induce the production of active oxygen in plant cells, leading to membrane lipid peroxidation . MDA is known as a biomarker of lipid peroxidation . Furthermore, proline acts as an osmoprotectant in plants subjected to drought stress . In this study, significantly higher proline and lower MDA contents were revealed in TaMYBsm3-D transgenic Arabidopsis under drought stress compared with that of WT plants. These results suggest that the drought resistance ability of TaMYBsm3-D is associated with relieved lipid peroxidation and stable osmotic pressure. Currently, the transcriptional regulatory networks of abiotic stress responses have been deeply studied in Arabidopsis. Some stress-responsive genes provide important information regarding the mechanism of TaMYBsm3-D involved in the drought stress response. In our study, P5CS1, DREB2A, and RD29A, three downstream genes, were upregulated significantly in transgenic plants under drought stress. 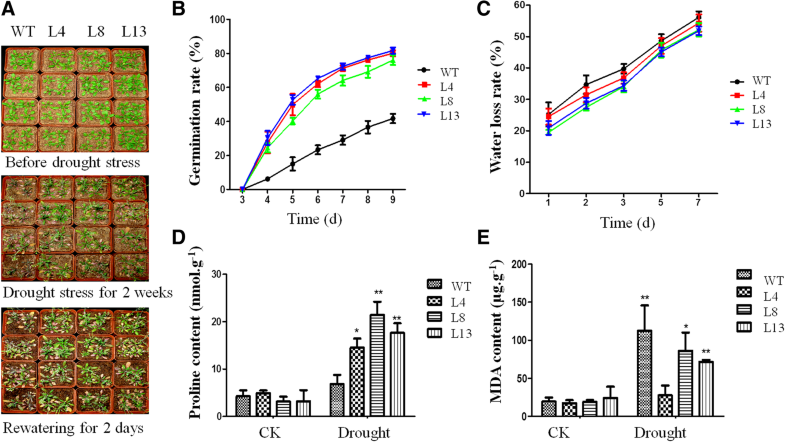 DREB2A is TF associated with drought and high-salinity stress responses . It has been reported that up-regulated DREB2A enhances drought tolerance by activating stress-inducible genes . In Arabidopsis, DREB2A could be induced by high-salt stress or dehydration (Liu et al., 1998; Nakashima et al., 2000; Sakuma et al., 2002). The up-regulated DREB2A enhances the tolerance of TaMYBsm3-D transgenic plants to drought stress by activating stress-induced genes. P5CS is known to be a rate-limiting enzyme in proline biosynthesis, mutations of which result in decreased salt tolerance in transgenic plants (Székely et al., 2008). The overexpression of P5CS promotes the drought tolerance of tobacco [42, 43], whereas silencing of P5CS1 inhibited the drought tolerance through suppressing proline synthesis and reactive oxygen species accumulation . The accumulation of proline induced by P5CS can enhance the drought tolerance of TaMYBsm3-D transgenic plants. Additionally, RD29A is important in the ABA-related response to drought through regulating the osmotic potential . Desiccation induced RD29A with two-step kinetics, which indicated that RD29A had two or more cis-acting elements, one associated with the ABA-associated response to desiccation, while the other induced by osmotic potential changes (Yamaguchi-Shinozaki and Shinozaki, 1993, Shinozaki and Yamaguchi- Shinozaki, 2007; Hirayama and Shinozaki, 2010). Under drought stress, overexpression of TaMYBsm3-D increased the expression level of DREB2A in transgenic Arabidopsis and their drought tolerances were enhanced by activating some stress-inducible genes. Due to the upregulation of P5CS1, proline accumulated in TaMYBsm3 transgenic Arabidopsis, which increased the drought tolerance of the transgenic plants. In summary, we hypothesize that TaMYBsm3-D may function in drought tolerance through increasing the expression of abiotic stress-responsive genes, including P5CS1, DREB2A, and RD29A. The present study only analyzed the transcriptional regulation of genes to explain the stress response at protein level. Further study is needed to elucidate the regulation mechanism at translational level. Additionally, functional verification of the effect of TaMYBsm3 genes on drought tolerance is still limited to Arabidopsis. Further research on the roles of TaMYBsm3 genes in wheat and regulation mechanisms at the translational level are still needed. In conclusion, the TaMYBsm3 genes are MYB-CC type TF genes. Overexpression of TaMYBsm3-D improves the drought tolerance of transgenic Arabidopsis through up-regulating P5CS1, DREB2A, and RD29A. This study was funded by the National Key Research and Development Program of China (grant number 2016YFD0101802, 2017YFD0300408). YQ-L and SC-Z contributed to the study design, conducting the study, data analysis, and writing of the manuscript. N-Z, WY-Z and MJ-L contributed to the data collection and conducting the study. BH-L and ZL-S contributed to data interpretation and discussion. ZL-S is the guarantor of this work and, as such, has full access to all the data in the study and takes responsibility for the integrity of the data and the accuracy of the data analysis. All authors read and approved the final manuscript.